While the Houston Astros and Los Angeles Dodgers will both be trying to take a step toward winning the World Series tonight, one 7-year-old girl already realized a dream. Hailey Dawson, who has a 3-D-printed prosthetic hand, tossed out the ceremonial first pitch tonight at Minute Maid Park in Houston. It's Hailey’s dream to pitch at all 30 major league stadiums and eventually break the world record for the most first pitches thrown at separate, major league ballparks, her mother, Yong Dawson, said. "She inspires people all the time," Yong Dawson said. "And what she tells me is, 'I'm just being Hailey.'" The Henderson, Nevada, girl has Poland syndrome, a rare birth defect that caused her to be born without three fingers on her right hand. She uses a special 3-D-printed hand that was developed by engineers at the University of Nevada, Las Vegas. Just like she would with a pair of shoes, as Hailey grows, she will outgrow her prosthetic hand. She'll go through a handful more in her lifetime, but this one is special. This is the hand throwing out the first pitch at the World Series. This hand has also garnered quite a few autographs. Second only to pitching on a major league mound, Hailey likes getting signatures on her hand, her mom said. This was Hailey's most-watched pitch yet, but she says she wasn't nervous. When asked what it's like to throw the first pitch on such a large stage, she replied with only one word: "Exciting." 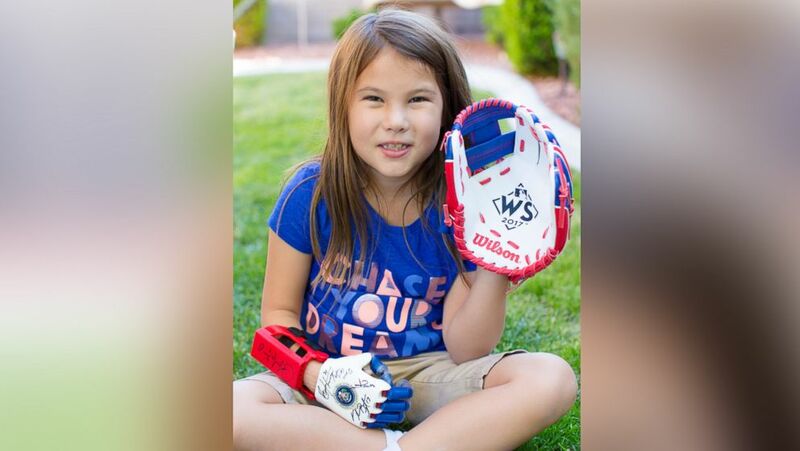 (Yong Dawson) Hailey Dawon, a 7-year-old girl from Nevada with a 3-D printed prosthetic hand whose dream of throwing the first pitch at every major league ballpark, will throw the first pitch at Game 4 of the World Series tonight, on Oct. 28. The pitch will do more than help Hailey achieve a goal, her mother says. Major League Baseball is working hand in glove with Hailey to bring awareness to Poland syndrome and help people realize how easily accessible robotic hands are. And as for who she likes in the World Series, Hailey says Astros all the way.